The annual trip to the market town of Abergavenny to sample some Christmas cheer from The Salvation Army playing festive songs on the high street to shoppers bustling for bargains in the vintage market. Abergavenny Market only opens on Tuesdays (why?) 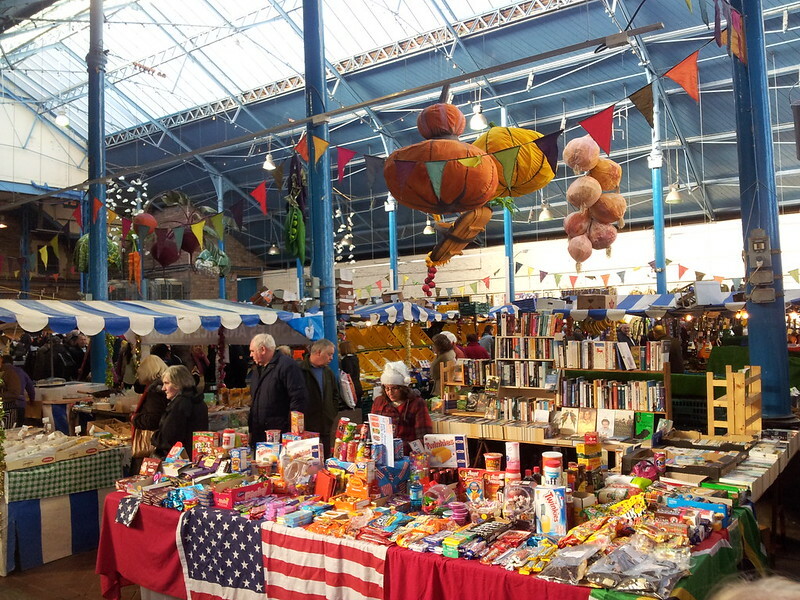 with the indoor and outdoor market having around 200 stands selling a huge range of goods ranging from fresh meat and veg to the damn right odd like battered old vhs tapes and knitting patterns! There was also a lot of tat being sold there that even some charity shops wouldn’t be seen with! 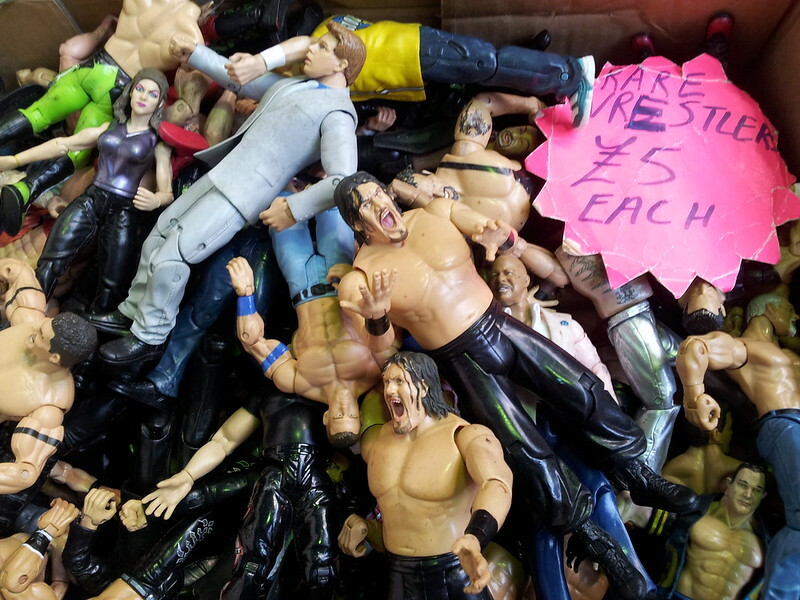 But there was one stall that was devoted to selling action figures – and this box contained a whole selection of ‘rare wrestlers’ at £5 each! A lot looked they had already been in a fight! Customers were stocking up on Christmas food and I’ve never seen so much meat being sold so quickly on the auction stalls with bag after bag going ‘for a tenner’ – amazing to watch this in action. 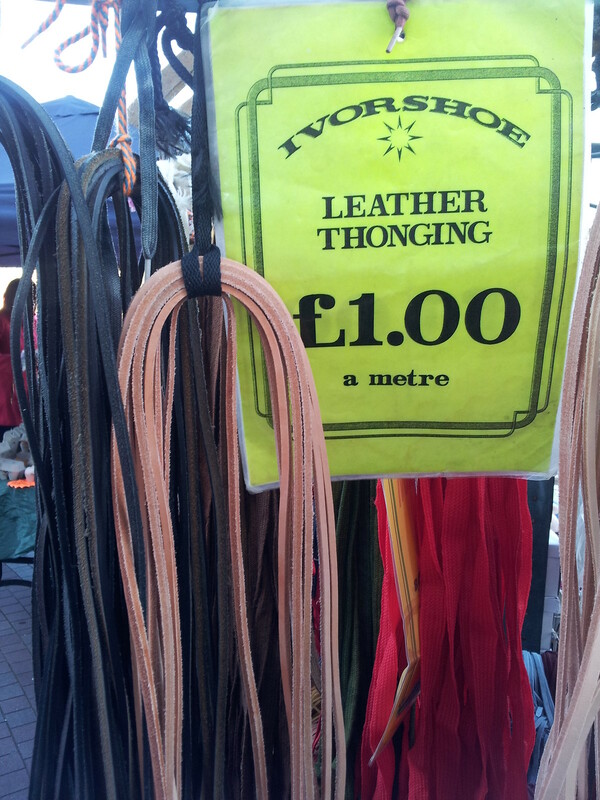 I’ve heard of leather and i’ve heard of thongs but ‘Leather thonging?’ It’s sounds painful and would surely chaff quite a bit ? 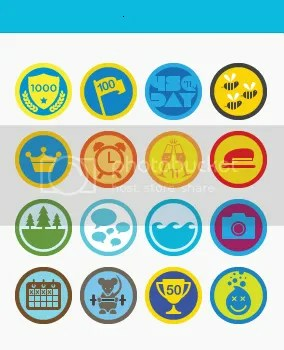 – but nevertheless someone here thinks there is a market for this product in this quiet town! Which brings me on to the most awful, tenuous labelling of a product ever! Two inconspicuous looking pieces of wood were lurking in a corner and caught my attention for all the wrong reasons! Four legs have been ‘cleverly’ attached to a small piece of trunk and another smaller ‘carved’ bit attached to create the head portion. Stick on two smaller wooden pieces to the head for some ears and what have you got? 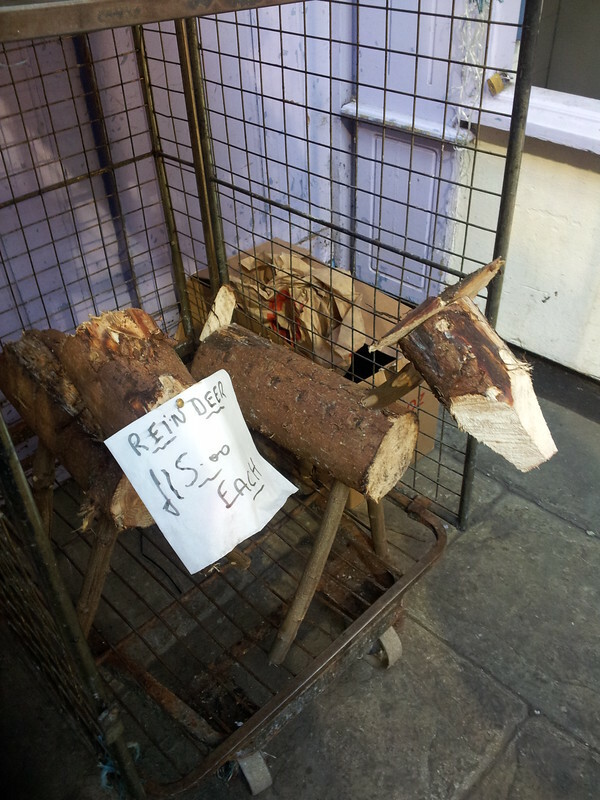 Ummmm well….I would NEVER have guessed unless someone had helpfully labelled the product as a REINDEER! Yes – use your imagination, let your senses go a bit wild and dispence with all belief and you may actually just see a reindeer! Even a sprig of mistletoe or something to give it some antlers may have helped but for £15 a pop I can’t see anyone crazy enough to buy this – not even to burn on the fire! Abergavenny is such a wonderful little place with some quirky shops and pubs full of festive cheer. Merry Christmas everyone and I hope these reindeers aren’t assisting Santa with this year’s deliveries!